Here's a superb new online slots game from Eyecon Gaming, worth playing. 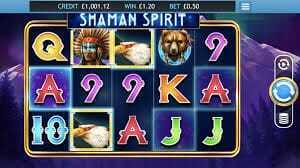 The Shaman Spirit slot is a Native American based game with a unique mystical charm. It takes you on a journey through history with the chance to win big. Its 3D graphic design immerses you into the game and the animal symbol illustrations feel spiritual. Nature is a dominant aspect of the theme with mystical mountains in the distance rising against a night sky. The spin to win slots reels are decorated with spirit animal symbols decked with ceremonial decorations and feathers. Click on the coin icon to set the number of paylines and stake per win line. There are 25 paylines although you can adjust the number and bets start from 0.01 to 0.50. That means minimum bets start at 0.25 and the maximum is 12.50. Eyecon Pty Ltd is a software company in Brisbane, Australia. Their specialty is land-based and online slot games. They claim to have released more than 100 slot machine games, most having impressive gameplay features and 3D animations. Eyecon also has a variety of live casino classic games and bingo titles. Eyecon has been in operation since 1997, way before the online betting revolution began. The company isn’t really well-known as they tend to focus on land-based games and improving the online gaming scene. So Eyecon could be classified as one of many traditional gaming companies, dedicated to incorporating its games on multiple playing platforms. If you love promo's, get the best recent slot offers today. This slot is a sequel to a popular title from Eyecon- Shamans Dream. According to ancient Native American culture, shamans are guardians of knowledge and spiritual wisdom. The Shamans’ spirit lives on in this game with animals of the totem pole. This is a highly revered object. The poles are sacred- they are the embodiment of an animal's spirit. These animal spirits are guides that give power to a person they are designated to care for. The player’s mission is to guide the animal spirits to meaty winnings as you spin the reels. Some of the symbols on the reels include a horse, a bear, an eagle, buffalo and wolf. Each one of these animals has a spirit power to share like the wolf with the spirit of creativity and freedom. The eagle’s power is visual sense and instinct. The classic playing card symbols J, 9, Q, K, 10 and A are also part of the reels. They are redesigned to fit the game’s theme- bright colours and a Native American style block motif edging. WILD - The wild symbol in this game is the Spirit Woman symbol. It can replace all the other symbols on the reels (except the Scatter) and form winning combinations. All the rewards will double when players form winning combinations with a Wild Symbol. 2 wins with wild symbols earn you 10 coins, 3 wins make 200 coins, 4 wins lead to 2,000 coins and 5 get you 9,500 coins. SCATTER - The scatter symbol is the Warrior. When 3 or more Warrior symbols appear on the reels, your prize is a scatter multiplier of 5x, 20x, or 450x your stake. 3, 4 or 5 of these symbols on the reels can trigger the Free Spins round. The least amount of spins rewarded is 15 Free Spins.